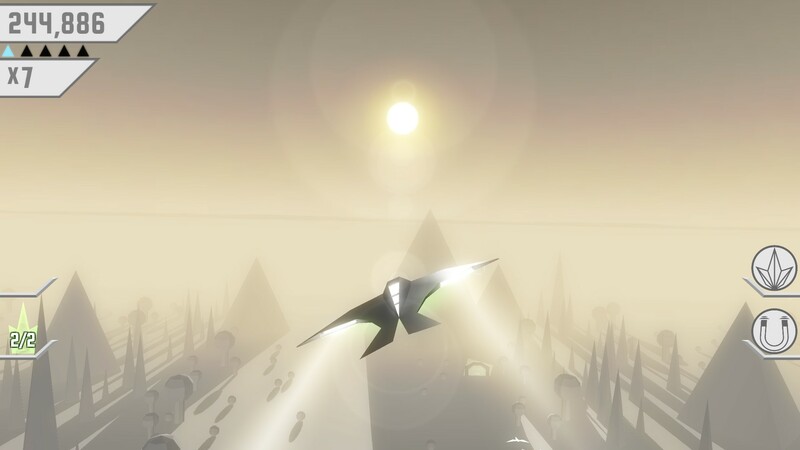 As far as endless runners (or “racer,” in this case) go, Race the Sun from developer Flippfly is one of the more intriguing ones. It places emphasis on user-created content, melding player-made levels with the main-game attractions marvelously. Minimalist design that extends beyond mere aesthetics create strong, blistering play, tightly packed levels providing challenge steadily without feeling overbearing. 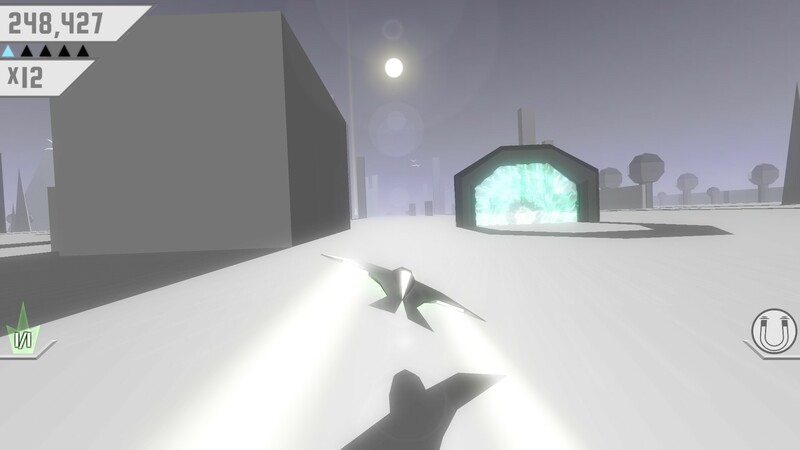 What begins as just another basic endless runner very quickly grows into something far bigger. Race the Sun brings forth a ton of fun and delivers a splendid take on a crowded genre. You pilot a solar-powered craft speeding through a never-ending expanse. Collecting tris – vector-line pyramids – is the game, your job to grab as many as possible while avoiding the myriad obstacles that make up the geometry until either the sun sets or you crash. Points are earned through a mixture of distance traveled and tris, the latter especially so once the score multiplier comes into play. Race the Sun begins unassumingly enough, delivering only the barest mechanics. Then you start leveling up, however, features suddenly being introduced at a starling clip, adding depth and complexity. A trio of objectives to complete (such as avoiding collisions for x number of regions, collecting a certain amount of tris, performing barrel rolls, and so on) accompany every run, each with a certain experience value attached to them. Fulfill enough and you level up, opening up new gameplay elements. Pick-ups that extend the daylight, jump power-ups, modes, ship attachments, and more make up the rewards. All effect play in significant ways, serving to make longer successful runs easier (attachments, for instance, which give the craft some useful buffs, such as widening the range for grabbing tris), or harder, in some cases. Namely, portals, which either allow you to skip a region entirely or travel to a user-created level for a brief change of pace. They’re presence complicates matters, as they can either be hugely advantageous or ruinous depending on when you decide to warp and to where. Certain user-levels are simple and contain a surplus of easily obtained tris, while skipping regions altogether allows you to jump past especially difficult areas. Teleport too soon and you risk working with less time due to missing sunlight extensions; act too late, however, and you lose the chance to warp altogether. The gate there is what whisks you away to a user-made level. It can be real tough to enter them on account of how they place themselves in less than opportune spots. It’s a game of constant split-second strategy. Where you go and how you spec your ship determines how successful a run will be. Following the line of tris before you may prove effective, but veering off to the right might be more plentiful. Taking risks often lead to riches; it’s merely a question of whether the danger is worth it. Alone, chances are you won’t get very far. Defeat is inevitable: whether at the hands of the sun or through your own demise. 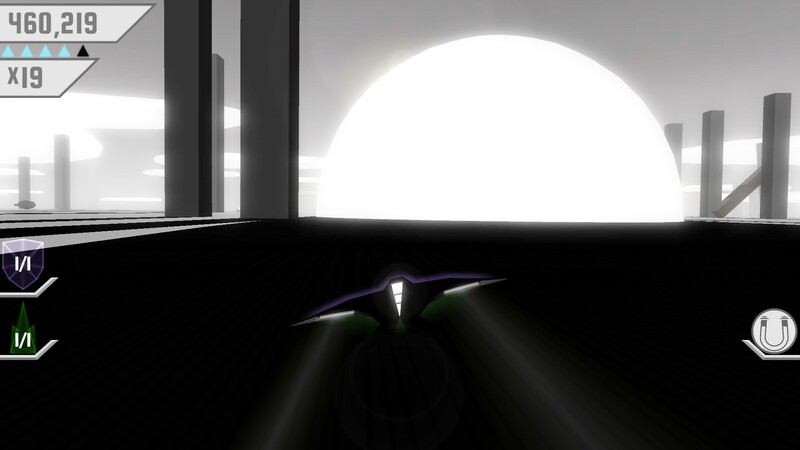 Race the Sun may not feature multiplayer (leaderboards are as far as it goes), cooperative play nonetheless exists through the relay mode. At the end of every attempt, the game generates a URL. With this address, other players may pick up where your run ended, all contributing to a combined team score. Up to four players can partake in this, the relay finishing once group has all tried their hand. It works best with a crew familiar with the level, but is a smart means of adding co-op all the same. Race the Sun has only two tracks. The catch is they regenerate every 24 hours, meaning you never experience the exact same track twice. Although the limited tile-set means you see more than a few specific landmarks. Nevertheless, they still feel different from one another. Even if you’ve seen the same mountains time after time, the subtle changes in how they’re doled out throughout the area ensure a sense of distinction between today’s track and yesterday’s. Race the Sun has two modes: “Race the Sun” and “Apocalypse.” The former is the main mode, wherein the land steadily builds challenge over time as the environment becomes increasingly dense. It’s Race the Sun at it’s purest. The latter, on the other hand, is the game at its finest. In Apocalypse, Race the Sun throws everything it has at you all at once. Explosions go off every other second, blinding you should you pass through them; pillars fall constantly, demanding split-second maneuvers to stand any chance of avoiding; blocks, orbs, and other obstacles constantly shift about, rarely granting safe and easy passage; and above all, it begins at sunset, so time is limited. It’s rough, frustrating, and exhilarating, showcasing Race the Sun at its best and most chaotic. Making any progress proves almost impossible – I could only get anywhere through warps – but the sense of reward earned for surviving even a single section of the mode makes it all worthwhile. This mode doesn’t unlock until you reach level 11, however, so you have to work for it. Though it hardly ever feels like work. Race the Sun moves so quickly that you’ll be making run after run after run without even trying, fulfilling objectives and leveling up in no time at all. Some of the goals take some serious trial and error, which bogs down the game slightly, but the promise of new gameplay mechanics makes the rare grind worth enduring. Race the Sun balances simple design and superb depth to incredible effect, culminating in one of the best games of its class.